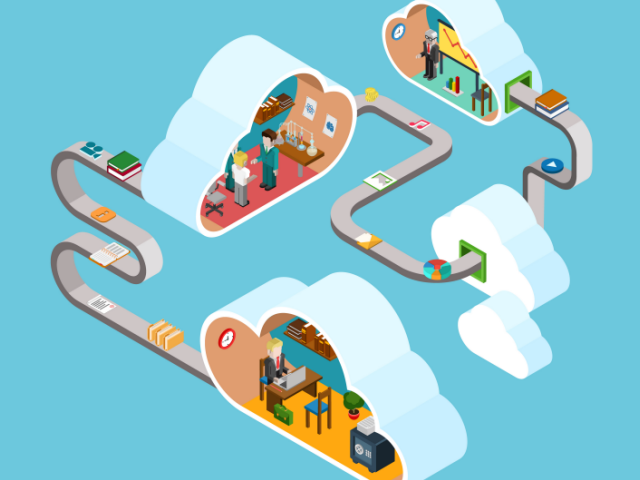 Here are 10 reasons why small businesses should consider moving some of their needs to the cloud. Cloud computing is the way of the future and no matter what size your business is, it can be greatly beneficial. Cloud services can be especially practical for smaller organizations because they reduce internal IT resources and the time spent managing them. Instead of relying on additional hardware and software and people to manage and secure them, organizations can take advantage of cloud's flexibility, scalability, security, availability, reliability and more. Web, ecommerce, email and application hosting Backup and recovery services Office tools, productivity, collaboration and communication solutions Help desk and IT support, including security Marketing and customer relationship management (CRM) Financial management, such as records keeping and expense management Operations and human resources Project and product management By utilizing infrastructure as a service (IaaS), platform as a service (PaaS) and software as a service (SaaS), small and medium sized businesses (SMBs) can save time and instead focus on new opportunities. For most SMBs, moving to the cloud also means cost savings, allowing companies to reinvest the money saved into other initiatives. Let's take a closer look at some of the top reasons why your business should consider moving to the cloud. In a technology-driven world, the main goal for many businesses is to maintain a competitive edge. Utilizing cloud services allows for easier access, which increases speed and scale, especially against competition, and smaller companies have a chance to compete with larger corporations with the use of pay-as-you go plans. Utilizing cloud services has an impact on the environment. While reducing some output costs for companies, this is a unique and innovative way for organizations to become more sustainable. Servers have the ability to fluctuate to perfectly accommodate your specific needs. In turn, the energy output is not superfluous. With cloud access, you and your team do not have to be bound to working in one place and on one system. You can easily access any pertinent data from anywhere utilizing cloud systems. This means SMBs are free to hire remote workers without having to open up new business locations. Because all of your important data is stored in the cloud, if a laptop gets lost or stolen your data stays secure. And no matter what machine you decide to use, you will have access to all of your important and pertinent data. This offers a great sense of security in the fact that you no longer have to worry about losing information or not being able to access files. One of the worst things a business can go through, is a system failure. In the cloud, your information is replicated across various data centers, so if something does happen with the hardware in the office, the data is not lost and you can maintain operations. The information can be accessed on a different device, and a business does not have to worry about having to rebuild a database or restore access for users. In addition to energy savings from not having to run servers on site, SMBs can also save office space needed to house the hardware and save time on software updates and general maintenance. There's no need to worry about downtime, which can improve the overall productivity and streamline many processes. IT teams can focus on being proactive, working on project that matter instead of constantly putting out fires. When people can't make it to the office, it's important for them to be able to have access to the same information they could in the office. Small businesses cannot afford to lose work time, even when workers can't make it in, for whatever reason. Using cloud services also allows you to scale up or down, depending on your needs, so you're only paying for what you need at the time. This is great for companies that experience seasonal changes or growing pains. Utilizing cloud service allows you to integrate the back office operations better than ever before. With the ability for several people to utilize one central system and access all data allows for a seamless transition in the way that business is conducted. With cloud services all company data is easily accessible to those who need access, which increases productivity and enables collaboration, allowing teams even in different locations to get things done. Being able to easily share and collaborate on files, see updates in real time and use web conferencing for important meetings will help your staff get more done. There is nothing better than automatic software updates. By having servers off-site, you essentially do not have to put any thought or effort into maintaining them. That is the service being provided to you by your cloud provider. You can focus on what's important and how to continue to grow your business, staying proactive and competitive.